“I thought that I was absolutely 100 percent going to be a reporter and wanted to travel the world, and I wanted to make films like ‘Restrepo’ and go to post-conflict areas,” Makam told NBC News. Today, the 27-year-old does travel the world as a member of The Babel Project, a youth media organization she co-founded that partners with underrepresented communities around the world to tell their stories. Instead of producing work directly, the organization teaches young people digital media and storytelling skills so they can advocate for themselves. The idea for the organization came to Makam while she was in graduate school. After finishing an undergraduate degree in journalism and social and cultural analysis at New York University, she went on to obtain a master’s in international affairs with a concentration in human rights and media at The New School. While there, Makam discovered a second passion for social justice issues and studied different grassroots movements. She began to question if she should be the one telling the story, or rather pave the way for others to share their own. The daughter of Indian immigrants, Makam grew up in an immigrant-centered community within Chicago, Illinois. Her first friends and heroes were immigrants and mainly women, she said. It was the convergence of her upbringing, love for journalism, and passion for social justice that led her to create The Babel Project with co-founder and fellow The New School alum Carlos Cagin. “I want [young learners] coming up in the next generation, really thinking about the news, who’s crafting the stories, and who is in control of that, so that’s really special for me,” Makam said. As a graduate student in 2012, Makam proposed a three-month research project — originally titled “Amazwi Wethu,” which translates from the South African language of Xhosa to “Our Voices”— to her master’s program, which sent her and Cagin to Cape Town, South Africa. 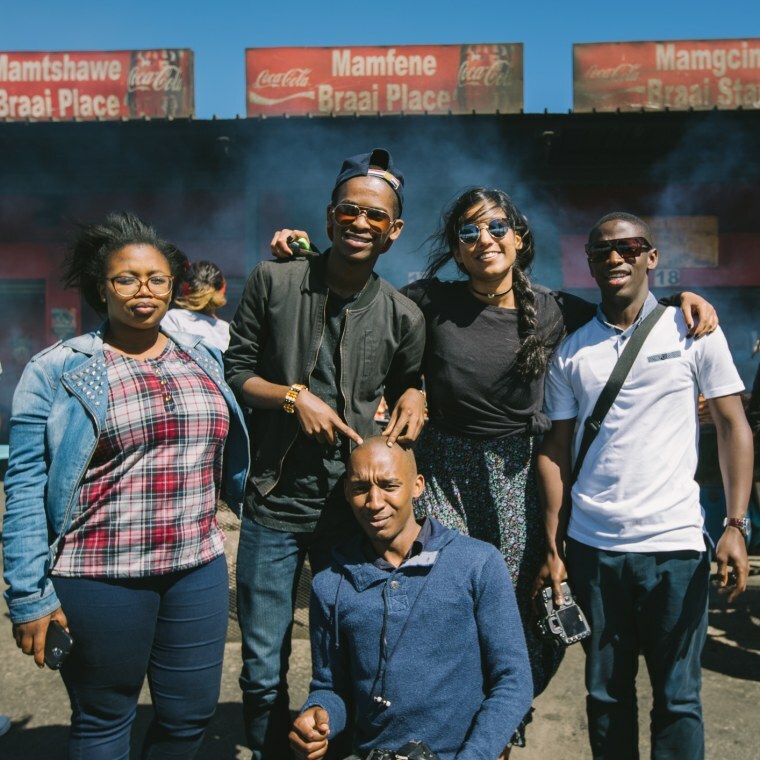 There, The Babel Project partnered with Equal Education, an educational grassroots movement based in the township of Khayelitsha that advocates for black and brown students who reside within the country's slum communities. Their work in Cape Town led to the launch of a now fully funded, locally sustainable organization in South Africa that has provided some of its alumni and activists with the skills to pursue film school, use their documentaries as work in human rights court cases, and in recent Equal Education campaigns. After a year of setting foundations in South Africa, Makam brought her work back to New York City, where The Babel Project has partnered with local schools and Make the Road New York, an organization that advocates for immigrant communities and recipients of deferred action immigration status. One activist, Perla Lopez, shared her story via documentary, and later earned a seat as the only undocumented person represented on the International Migrant’s Day Panel at the United Nations in 2016. The project has also expanded to Ferguson — working with the Black Lives Matter movement — and has traveled to Palestine in partnership with the Al Rowwad Centre for Culture and Theatre located along the West Bank. It is the implementation of storytelling for activism that motivates Makam to continue providing others with the tools to share their own stories. “I find that telling stories is one thing, but making a strategic impact with stories is far more important to me and when you let people in communities take control of [their stories] that’s when you make an impact, so that’s the most important part,” she said. This concept of allowing communities to take control of the way their stories and members are portrayed was put into practice when Makam traveled to Ferguson and partnered with a group of young female protesters to produce a short film titled, “Youth Speak Truth”. The film premiered on the two-year anniversary of the death of Michael Brown — an unarmed black teen who was shot and killed by police. Makam and The Babel Project were able to team up with the Truth Telling Project and the Mike Senior Foundation for an event that would bring positivity to the tragedy in Ferguson. Members of Brown’s family and others who have been the victims of police violence were invited to share the stories of their lost ones in ways that they would be positively remembered. “We really wanted it to be a moment that was not just rooted in tragedy, but remembering what were the funny things that we don't know about Mike Brown Junior,” Makam said. “He was a prankster. He used to pull these ridiculous pranks on the family where he would put hot sauce in your mouth when you were sleeping." Currently, The Babel Project is doing work in the Aida refugee camp in Palestine to display the lives of everyday Palestinians. The refugee camp focuses on allowing its activists to evoke resistance through the expression of the arts, rather than acts of violence. There, The Babel Project used visuals to display the obvious differences from one side of the Palestinian-Israeli border to the other. Makam is happy — if surprised — at the amount of work The Babel Project has accomplished in the last five years, from the work in Ferguson and South Africa to the organization's current projects. The Babel Project has become the bulk of her life. Makam holds the title of both co-founder and executive director and is a fellow at the Social Change Initiative. She hopes that The Babel Project will turn into an educational resource for other activists to better benefit their cause and campaigns.